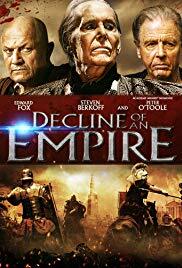 Storyline:  Decline of an Empire (2014) Katherine of Alexandria, brought up as a nomad and living in the desert, was aged just 11 when Emperor Maxentius saw her whilst out on patrol. Consumed by her beauty, impudence and uncanny talent for languages, he abducted the child, killing her family. The slaughter was witnessed by her young friend, Constantine, who would later become Emperor of the Western Roman Empire. He never lost hope of finding Katherine. As a young woman, Katherine refused to submit to Maxentius' offers of marriage and she continually denounced his brutal enforcement of pagan religion upon the masses. Still obsessed with her beauty, Maxentius brought Katherine before 50 of Rome's finest scholars in an open court in Alexandria, where she eloquently demolished their arguments. When Constantine learned of Katherine's whereabouts and imprisonment at the hands of Maxentius, he led his army from York in a desperate bid to save her.